The clan originated when the founder, Nakatomi no Kamatari (614–669) of the Nakatomi clan, was rewarded by Emperor Tenji with the honorific "Fujiwara", which evolved as a surname for Kamatari and his descendants. In time, Fujiwara became known as a clan name. The Fujiwara dominated the Japanese politics of Heian period (794–1185) through the monopoly of regent positions, sesshō and kampaku. The family's primary strategy for central influence was through the marrying of Fujiwara daughters to emperors. Through this, the Fujiwara would gain influence over the next emperor who would, according to family tradition of that time, be raised in the household of his mother's side and owe loyalty to his grandfather. As abdicated emperors took over power by exercising insei (院政, cloistered rule) at the end of the 11th century, then followed by the rise of warrior class, the Fujiwara gradually lost its control over mainstream politics. Among them, the Hokke came to be considered as the leaders of the entire clan. All four brothers died in 737 during a major smallpox epidemic in Japan. Just before the move to the Heian-kyō, the Emperor had abolished universal conscription in the eighth century and soon local, private militaries came into being. 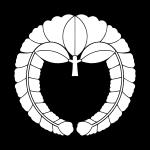 The Fujiwara, Taira, and Minamoto were among the most prominent families supported by the new military class. Within decades of Emperor Daigo's death, the Fujiwara had absolute control over the court. By the year 1000, Fujiwara no Michinaga was able to enthrone and dethrone emperors at will. Little authority was left for traditional officialdom, and government affairs were handled through the Fujiwara family's private administration. The Fujiwara had become what historian George B. Sansom has called "hereditary dictators". A struggle for succession in the mid-twelfth century gave the Fujiwara an opportunity to regain their former power. Fujiwara no Yorinaga sided with the retired emperor in a violent battle in 1158 against the heir apparent, who was supported by the Taira and Minamoto. In the end, the Fujiwara were destroyed, the old system of government supplanted, and the insei system left powerless as bushi took control of court affairs, marking a turning point in Japanese history. Within a year, the Taira and Minamoto clashed, and a twenty-year period of Taira ascendancy began. The Taira were seduced by court life and ignored problems in the provinces. Finally, Minamoto no Yoritomo (1147–1199) rose from his headquarters at Kamakura (in the Kantō region, southwest of modern Tokyo) to defeat the Taira, and with them the child emperor Emperor Antoku they controlled, in the Genpei War (1180–1185). After this downfall, the younger branches of the Fujiwara clan turned their focus from politics to the arts, producing literary luminaries such as Fujiwara no Shunzei or Fujiwara no Teika. During the 13th century, the Fujiwara northern house (Hokke) was split into the five regent houses: Konoe, Takatsukasa, Kujō, Nijō and Ichijō. They had a "monopoly" to the offices of sesshō and kampaku, and served in turn. The political power had shifted away from the court nobility in Kyoto to the new warrior class in the countryside. However, Fujiwara princes remained close advisers, regents and ministers to the emperors for centuries, the family remained and political reputation and influence even until the 20th century (such as Fumimaro Konoe and Morihiro Hosokawa, who became the Prime Ministers). As such, they had a certain political power and much influence, as often the rival warriors and later bakufu sought their alliance. Oda Nobunaga and his sister Oichi were descended from the Taira and Fujiwara clans; regent Toyotomi Hideyoshi and shogun Tokugawa Ieyasu were related by marriage to the Fujiwara clan. Empress Shōken, wife of Emperor Meiji, was a descendant of the Fujiwara clan and, through Gracia Hosokawa, of the Minamoto clan. Until the marriage of the Crown Prince Hirohito (Emperor Shōwa) to Princess Nagako of Kuni (posthumously Empress Kōjun) in January 1924, the principal consorts of emperors and crown princes had often been recruited from one of the Sekke Fujiwara. Imperial princesses were often married to Fujiwara lords – throughout a millennium at least. As recently as Emperor Shōwa's third daughter, the late former Princess Takanomiya (Kazoku), and Prince Mikasa's elder daughter, the former Princess Yasuko, married into Takatsukasa and Konoe families, respectively. Likewise a daughter of the last shōgun married a second cousin of Emperor Shōwa. ^ Nussbaum, Louis-Frédéric et al. (2005). "Fujiwara" at Japan Encyclopedia, pp. 200-201, p. 201, at Google Books. ^ Technically speaking, the name Fujiwara was kabane (姓, relationship with Emperor), not kamyō (家名, lit. "family name") nor Myōji (苗字, lit. "surname"). In other words, there was no kuge (court noble) family called Fujiwara but a group of nobles who shared the same kabane Fujiwara. For more about names in Japan, see Japanese name. ^ Nussbaum, Fujiwara no Kamatari at p. 203, p. 203, at Google Books. ^ Nussbaum, "Fujiwara no Fusasaki" at p. 202, p. 202, at Google Books. ^ Nussbaum, "Fujiwara no Maro" at p. 205, p. 205, at Google Books. ^ Nussbaum, "Fujiwara no Muchimaro" at p. 207, p. 207, at Google Books. ^ Nussbaum, "Fujiwara no Umakai" at p. 211, p. 211, at Google Books. ^ Farris, William Wayne (1985). Population, Disease, and Land in Early Japan, 645-900. Harvard University Asia Center. p. 59. ISBN 9780674690059. This page was last edited on 4 March 2019, at 07:41 (UTC).